I make custom Butterfly Creatures to order. They can be customized according to your wishes. You’re welcome to choose your colors and style. Please, send me a message so we can discuss more about design and how long creation takes. This artwork is just an example. 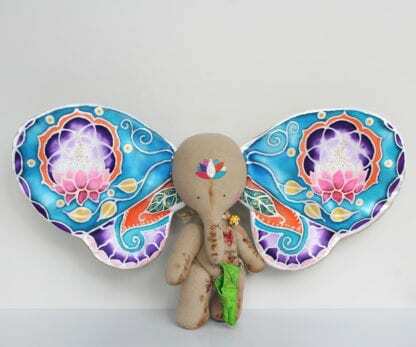 You’re welcome to order your one of a kind Butterfly-Elephant. I make magical elephants totally by hand. All materials are high quality and safe. Each toy is absolutely unique and it takes me a lot of time to make a new one. You can read curious things about how he is made below. You can choose your design by points below. But don’t worry if you can’t do it. Because I’m always happy to make it for you. Elephant’s ear-wings are made of satin which hand painted with cold batik technique . They are movable and you can fix them in any position. I use paints and hands, so you can choose any colors and drawing theme you love. Toy is filled with hollowfiber. Arms, legs and head are connected with the body with metal cotter pins. They are rotatable in 360 degrees. Magical elephants have a leaf-bag (Oh, I haven’t said that elephant picks the morning dew inside this bag;). It’s hand sculpted from polymer clay. I can replace the leaf with something else you wish or leave it as it is. Of course any colors are possible. Also I can embroider few words on the body. In any case each butterfly-elephant is one of a kind. I don’t make copies. But welcome with any wishes. *Please note, I create a pieces of art and not toys for kid’s play. If you decided to purchase a magic elephant for children, take into account that I strongly do not recommend to wash it.